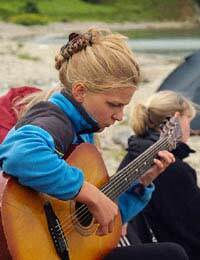 When summer approaches and your children have nothing to do, enrolling them in a summer music camp or music programme could be a great way to keep them occupied. If they have taken music lessons in the past a summer programme could reinforce their learning. If not, summer is a wonderful time to introduce them to the world of music. Many state-run programmes are available which offer either intensive or summer-long music courses over the summer months. They are often affordable as they are subsidised by the government, but waiting lists can be long. Sign up early to avoid disappointment. If your child already takes music lessons in school, they can enrol in a more advanced class to reinforce what they have learned over the academic year. The nice part of such programmes is that they often give a child a choice of two or more activities, such as guitar AND singing, so they can also try something new. For younger kids, music programmes usually balance out learning with musical games to keep things light and fun. Concerts often take place at the end of the programme so children can showcase to parents what they have learned. Private music programmes are also available, which cost more but which may suit your child better, as they might be closer to home, a more suitable level for your child etc. Ask around and look online to see what type of programmes would be best for you and your family. Music camps are open to children with a broad spectrum of musical ability, from beginners to those with years of experience behind them. The only thing they have to share is a love of music, and desire to participate. Sometimes summer camps are short-term and residential, sometimes they are day camps where children get full immersion for a week or more. Some parents find this a better way of learning than spreading out short lessons over the course of the year. It can also be a great way for children to progress more quickly, and thus return to school at a more advanced level. In the long run, it could even be cheaper! If your child has unusual interests, a summer camp can also be beneficial. He or she can enrol in a bluegrass camp for example, or one that concentrates on teaching African drumming or rock music. Suzuki camps are also available in the summer for children aged 2-plus who want to learn Suzuki violin, viola, cello or piano. Parents must be willing to participate as well as the kids. If your child shows signs of musical interest – or ability – why not introduce him or her to a new musical experience this summer? They don't have to be child prodigies to benefit from a music camp or programme. And if they do turn out to be the next Beethoven or Bach, you'll have only yourself to congratulate!